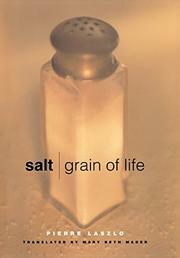 A chemist constructs a cultural history of sodium chloride and reveals its magnitude in human affairs. In a volume burdened with a plethora of introductory material (there’s a foreword, preface, acknowledgments, and introduction—and each short chapter begins with an old-fashioned argument, as well), Laszlo makes it plain that salt is no ordinary white powder. (In fact, he reveals, pure salt is colorless.) He begins with a sort of pedagogical manifesto, declaring that all education, like his study, ought to be multidisciplinary, and then moves into some engaging chapters dealing with various uses (and abuses) of salt. Sailors once used it to disinfect wounds. It was one of the earliest means of preserving food. Many ancient trade routes involved the transportation of salt. The word (and concept of) salary has its origins in salt. We learn how seawater is desalinated, how salt was important in the history of Venice, how Gandhi employed it as a powerful symbol to rally his followers; we learn why the sea is salty (a puzzle: after all, only fresh water flows into it), why salt will clear a wine spill on a tablecloth, why salty foods make you thirsty, why salt will dispatch a slug and will both freeze ice cream and thaw an icy highway. Toward the end, he even waxes metaphysical. Although the volume for the most part is highly readable, Laszlo occasionally allows his erudition to obfuscate, as in one sentence that includes all the following: “mitochondrial RNA sequences,” “lipid bilayer,” “glycerol,” “ether bonds,” “RNA-polymerases,” “prokaryotes,” and “eukaryotes.” Yet he can also decline into the lowest puns—e.g., he follows a comment about Morton’s attempts to prevent the problem of the hardening of salt with this: “It being salt, they licked it.” Readers may also find annoying the editorial decision to permit the translator’s numerous notes to appear in the text instead of in unobtrusive footnotes. Displays broad interests and a wide-ranging intellect, but the style—often bland or dully didactic—could use a bit of seasoning.